In order to give some structure to my ongoing investigation of git’s data structures, protocols and implementation I decided to re-implement git clone without using any of git’s plumbing commands or any of the existing git libraries. Along the way I tried to keep some implementation notes that should help to understand some of the building blocks required to replicate the clone functionality. The git clone implementation that came out of this exercise is obviously of very limited practical value but required investigating some areas of git a git user is rarely exposed to. The goal of this exercise was to go wide not deep. I will take certain shortcuts and omissions in order to implement a very minimal yet functional clone command. Note: There are a number of git related Haskell implementations and libraries already out there (e.g. gat - a git clone in Haskell or a number of git related packages on hackage) that I wasn’t interested in for the purpose of this exercise (learning from the bottom up). If you are after a Haskell git library those implementations are likely to be much better suited. and the index format used to track changes to the files in the working directory. While some of those areas are covered elsewhere (e.g. the fantastic article Git from the bottom up covers the low level commands and the design of the git object store in great detail) this article tries to tie together the areas mentioned above, describes the tools used to investigate and verify the observed behaviour and to hopefully provide enough detail for the reader to re-implement the git clone command in a language of their choosing. and we will get a valid git repository that can be used with the normal git client without making use of git or any git libraries for the actual clone and repository setup part. To keep the implementation focused, only the git:// transport protocol will be supported and the client will only do full, but not shallow clones. In this article I’m going to use Haskell to implement the command, mainly to avoid simply re-implementing the main C or the popular Java based JGit implementations that already exist and to be able to show code examples in a very conscise way. If you are not familiar with Haskell, simply think of the code examples as condensed pseudo code. The general approach was to investigate/reverse-engineer the actual behaviour when executing the clone command, gathering debug information by different means (e.g. git debug settings, packet capture, Dtrace), researching the protocols and data structures and reading the official documentation in the git source (esp. the Documentation/technical/*.txt files) and last but not least reading the actual git source. The clone operation goes through a set of stages. Parse the clone url to extract the host, port and repository path information. Connect to the git server via TCP using the native git transport protocol. Negotiate the objects that need to be transferrered from the server to the client. This includes receiving the current state of the remote repository (in the form of a ref advertisement) that includes the refs the server has and for each ref the commit hash it points to. Request the required refs and receive the pack file which contains all the objects that are reachable from the requested refs from the remote server. Create a valid git repository directory and file structure on disk. Store the objects and refs on disk. Populate the working directory with the files and directories that represent the tip of the ref the repository points to (taking into account symlink, permissions etc). Create the index file (staging area) that corresponds to that tip and the files on disk. In order to transfer the repository data (commits, tags, file contents, ref information) the git client and server processes negotiate the minimal amount of data required to update either the client (when fetching or cloning) or the server (when pushing). git supports four main transport protocols to transfer the repository data: a local protocol if the source can be accessed via the local filesystem, and the following three protocols for remote access: SSH, a native git protocol and HTTP. 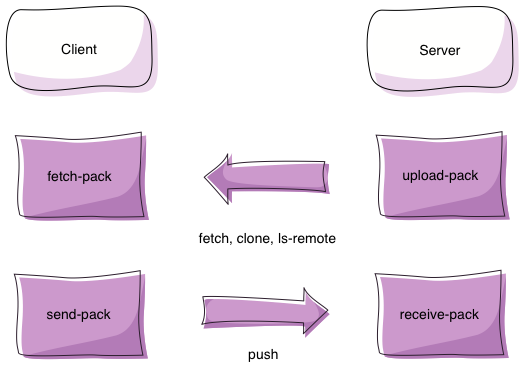 Note: For the clone operation instead of forking the git-fetch-pack command, clone invokes the fetch-pack.c#fetch_pack function directly via the transport.c layer to avoid one fork operation. For easier testing and debugging the focus will be on the git protocol only, a simple, unauthenticated transport that uses full-duplex communication between client and server with the server usually listening on port 9418. Note: git ls-remote can be used to list references in a remote repository. This happens to be the same remote lookup of refs that occurs during the initial clone phase 1 (this is called the ref advertisement or reference discovery step). As part of the reference discovery, client and server exchange information about capabilities the server supports. The client can then request certain capabilities to be in effect for the subsequent communication. The capabilities are described in detail in Documentation/technical/protocol-capabilities.txt and will be explained later on when they become relevant for the implementation. After reference and capability discovery, client and server try to determine the minimal packfile required for the client or server to be updated. In the simplest scenario of a full clone, the client requests all refs and all the required objects the server has. For subsequent updates (e.g. fetch), the client not only defines what it wants, but tells that server what refs it has so that the server can determine the minimal packfile to send down to the client. 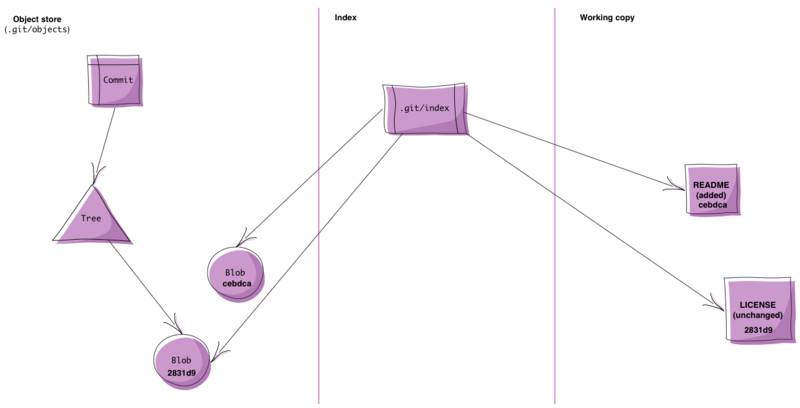 git’s protocol payload makes extensive use of the so called packet line (or pkt-line as used in the technical documentation) format. A pkt-line is a variable length binary string with the length encoded in the first four bytes of the pkt-line. The first four bytes 003f are the length of the entire string (including the leading 4 length bytes) in hexadecimal (003f hex = 63 dec). The pkt-line with length 0, i.e. 0000 is called the flush-pkt. A special case packet line that is used to signal that an agreed upon handover point in the communication exchange is reached. To get an intuition for how the git protocol works, it’s best to try and observe the communication between client and server. --export-all enables cloning from all directories that look like git repositories. Otherwise git daemon verifies that the directory has the magic file git-daemon-export-ok before exporting any repository data. See git-daemon for further information. With the git server running and having access to an existing git repository (which should be a bare repository without a working copy) we can now observe the exchange between client and server. This shows the actual exchange on the wire, with * as a placeholder for the non printable characters. Note: If you follow along, please update the interface to listen on, lo0 is the loopback interface on Mac OS X/BSD, it’s most likely lo on Linux - check with ifconfig. To simulate low bandwidth/high latency scenarios which sometimes makes debugging easier, I found using dummynet via ipfw as a traffic shaping tool useful. This is useful to observe fast local executions that would otherwise be hard to capture. With the necessary tooling to verify and observe the behaviour we can now look into implementing a client that speaks the git transport protocol. To initiate the ref discovery, the client establishes a TCP socket connection to the server on port 9418 and issues a single command in packet line format. Here localhost is the target host and /git-bottom-up the repository path on the target system. Note that by requesting the upload-pack to be used on the remote end we initiate a clone/fetch/ls-remote request used to transfer data from the server to the client. gitProtoRequest host repo = pktLine $ "git-upload-pack /" ++ repo ++ "\0host="++host++"\0"
-- | A git compatible TcpClient that understands the git packet line format. -- | Read packet lines. -- | Read a git packet line (variable length binary string prefixed with the overall length). -- Length is 4 byte, hexadecimal, padded with 0. Apart from the usual ceremony to set up and connect the socket, the readPacketLine function contains the git specific part of the TcpClient. The first step is to read 4 bytes from the socket to determine how many bytes to read to fully consume a packet line. readFully is a recursive function that is used to ensure to read the requested number of bytes from the socket as the contract for recv does not guarantee that the requested number of bytes can be read at once. Depending on the length of the packet line we consume the rest of the packet line or return Nothing. If the length signals that we received an empty packet (i.e. 0004 or a flush packet 0000) we stop reading and return Nothing (note: for readers unfamiliar with Haskell, Haskell’s return is quite different to the return used in imperative languages where it terminates the execution, in Haskell it is used to wrap a pure value in a container, here the IO monad). After the server returns the ref advertisement the client can terminate the connection by sending a flush packet (0000 - e.g. if the client is already up to date) or enter the negotiation phase the determines the optimal pack file to send from the server to the client. Now that the client has knowledge about all the refs the server advertised it can now request the refs it needs from the server. The clone use case is the simplest use case as a full clone simply requests all the refs the server has. The protocol contract requirest that at least one want command must be send and that the client cannot request a commit-id that wasn’t advertised by the server. Based on the refs the client wants, the server will generate a pack file that will contain all the required refs and the objects that are reachable from those refs. The server then send pack the packfile which will be stored by the client into a temporary location to then create a local git repository. This flow can be easily observed in the two following functions the client uses to implement the clone operation. The receivePack implements the packfile negotiation and returns both the actual raw pack file (as a strict ByteString) and the list of refs that the server advertised. That list will later on be used to recreate the refs in the local repository. "agent=git/1.8.1"] pack ++ flushPkt ++ pktLine "done\n"
One capability we want to have in effect is the side-band capability. This instructs the server to send multiplexed progress reports and error info interleaved with the packfile itself (see Documentation/technical/protocol-capabilities.txt). The side-band and side-band-64k capabilites are mutually exclusive and only differ in the size of the payload packets git will use (1000 bytes vs 65520 bytes in the case of side-band-64k). 2 this is progress information that the server sends - the client prints that on STDERR prefixed with remote: "
tmpPack = dir </> "tmp_pack_incoming"
To understand and implement the last two steps we next have a closer look at the pack file format. 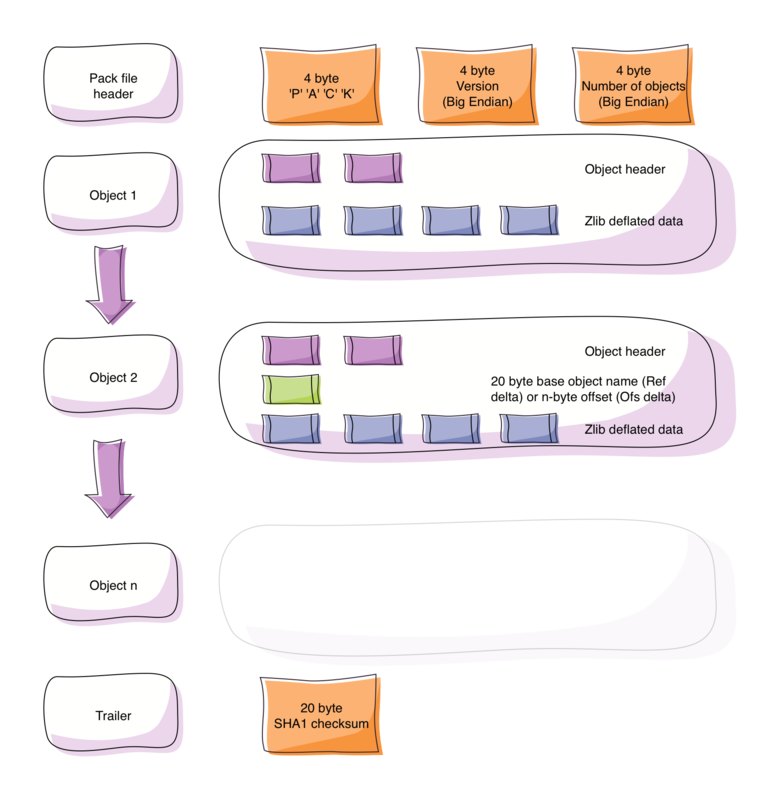 The pack file is used to efficiently transfer or store a number of git objects. When used as a storage optimization the *.pack file is accompanied by an index file that allows efficient lookup of objects in the pack file. When used as a transfer mechanism the pack file will be transfered as is and the index created locally. The pack format is described in Documentation/technical/pack-format.txt in the git source. only for deltified objects: the 20 byte base object name (for objects of type OBJ_REF_DELTA) or a relative (negative) offset from the delta object’s position in the pack for objects of type OBJ_OFS_DELTA - see below). The objects in the pack file are commit, tag, tree and blob objects. A deltified object has a pointer to a base object and as its payload the delta between the base version and the subsequent version of that object. See below for a discussion of the delta encoding git uses. Before we further investigate the pack file format it’s worth pointing out a few tools and commands that can be used to get a better understanding about how objects are represented in the pack file. The git verify-pack command can be used to validate pack files. This only works for *.pack files though that have an accompanying index file. This comes in handy when implementing the code that reads and recreates the objects stored in the pack file. Any suitable hexeditor (e.g. xxd, od or HexFiend, a GUI application on the Mac) is useful when it comes to reading and comparing the pack file data. Note: As part of the git clone process, the pack file needs to be read and understood to validate the objects that come in by comparing the checksums and to generate an index file for the pack that is stored in the local repository. For this clone implementation I’m unpacking the pack file into loose objects (one file per object) instead to simplify the streaming pack file handling - this is merely a shortcut though as it unnecessarily creates a large number of object files which makes cloning of large repositories slower than it needs to be. where packMagic = fromOctets $ map (fromIntegral . ord) "PACK"
The pack file object header uses a variant of a variable length unsigned integer encoding that contains the object type in the first byte. The following bytes after the first byte contain parts of the overall length in the least significant 7 bits of the octet while the MSB is again used to indicate whether more bytes need to be read. after shifting each part 0, 4 + (n-1) * 7 to the left. size0 is the least, sizeN the most significant part. After reading the last byte of the object header we have the size of the inflated/uncompressed object and its type. This allows the Git.Pack.Packfile module to fully read the pack file and to create an internal pack file representation that contains a list of PackfileObjects with fully inflated content. Before this pack file can be written to disk we need to handle the deltified objects though as our internal representation contains a mix of deltified and undeltified (i.e. complete) objects. The deltified representations (pack file object types 6 & 7) in the packfile use delta compression to minimize the amount of data that needs to be transferred and/or stored. Deltification only happens in pack files. Delta compression consists of representing a target version’s contents as the mutation (delta) of some existing source contents to achieve the same goal, a reduction in space or time. Typically, the target and source are related file versions and have similar contents. Thus delta encoding allows file versions to be recreated based on an original source file and one or more delta files. Subsequent delta files can be applied to the patched result of the previous delta file and its source (called the “delta chain” in git - the git verify-pack command will print a histogram of the delta chain length when invoked with the --verbose flag). An important attribute of the delta encoding is the fact that it can be used for both binary and text files. The delta compression algorithm that is used in git was originally based on xdelta and LibXDiff but was further simplified for the git use case (see the “diff’ing files” thread on the git mailinglist). The following discussion is based on the delta file format used by git and the patch-delta.c and diff-delta.c files from the git source. The git delta encoding algorithm is a copy/insert based algorithm (this is apparent in patch-delta.c). The delta representation contains a delta header and a series of opcodes for either copy or insert instructions. The copy instructions contain an offset into the source buffer and the number of bytes to copy from the source to the target buffer starting from that offset. The insert opcode itself is the number of bytes to copy from the delta buffer into the target. This will contain the bytes that have been added and are not part of the source buffer at this point. The delta buffer starts with a header that contains the length of the source and target buffers to be able to verify the restored/patched result. Lengths are again encoded as a variable length integer where the MSB indicates whether another var length octet follows. In order to test the delta encoding implementation the git source allows us to build a test-delta binary that can be used to generate delta data and to restore a target file from a source and delta representation. This workflow can then be used to generate arbitrary delta files and to test our own implementation. An example can help getting a better intuiton for how the delta encoding works. In a source file (the zlib.c file from the git source) a function definition was moved down inside the same file and a new comment added. 000001e: 01110100 10110011 11001110 00000001 00100111 00000001  t...'. 0000024: 10110011 01011111 00000011 01101100 00010000 10010011  ._.l.. The next two bytes are the length of the target buffer (which is 5932 bytes). where decodeSize will be called with the offset of the length information for the source (0 in this case) and target sizes (number of bytes required to represent the source size). After reading the header information the remainig btyes are either copy or insert instructions. The next byte (10110000) is a copy instruction based on the fact that the MSB is set. The offset into the source buffer and the number of bytes to copy can then be extracted as follows. None of the offset bits are set, we don’t read any offset value so the offset is 0. This means we copy from the start of the source buffer. 00000000 & 0x40 - 7th bit is not set. 465 is the number of bytes to copy from the source into the target buffer, starting at offset 0. The next byte 00010111 (byte 8) is an insert instruction (MSB not set). The insert instruction is simply the number of bytes to copy from the delta into the target buffer. λ > diff manual-target-zlib.c zlib-changed.c && echo $? This is 5905 for the base version + 50 bytes for the delta compared to storing both versions independently ()5905 + 5932). 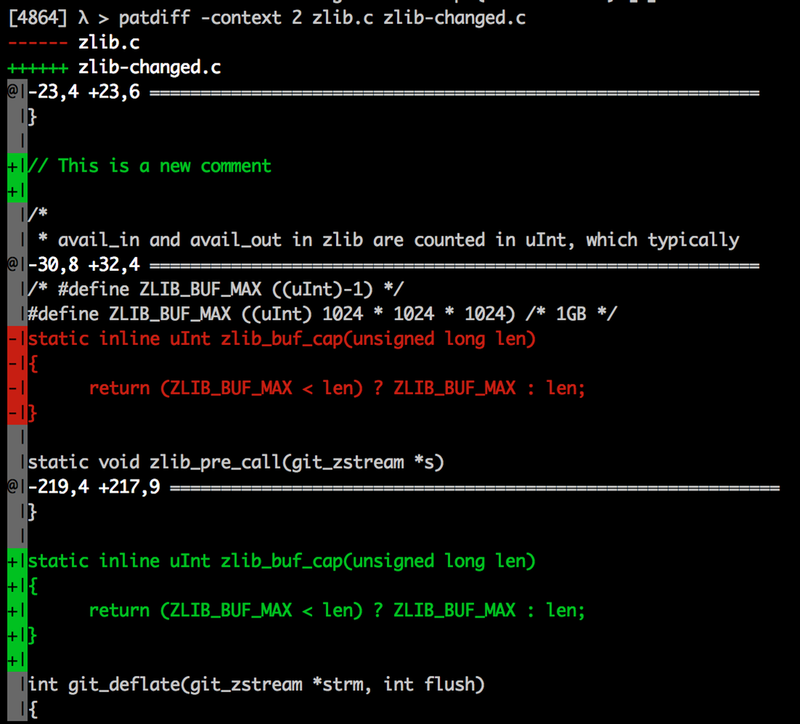 Git further reduces the space requirements by storing the base and delta objects zlib compressed in the packfile. For the clone implementation we only need to deal with the much simpler to implement patch operation that recreates the target content based on the source and the delta. This is fortunately much easier than the task of creating a suitable delta file based on the source and target files (see 2 for further discussion on this). The main function our Git.Pack.Delta module exposes is the patch function that accepts a source and a delta bytestring (bytestrings are Haskell’s version of byte vectors/arrays) and returns the re-created target bytestring. else Left "Source length check failed"
If the most significant byte is set this is a copy, otherwise it is an insert instruction. If it is an insert command the command itself is the number of bytes to copy from the delta into the target buffer so we simply apply the insertCommand function. With at working patch function we can now recreate the actual content based on the deltified and the base objects that are contained in the pack file. The pack file format defines two different types of deltified objects: OBJ_OFS_DELTA and OBJ_REF_DELTA. They differ only in the way the base (or source) object is identified in the pack file. OBJ_REF_DELTA uses the 20-byte SHA1 that identifies the object, whereas OBJ_OFS_DELTA uses the negative offset from the delta object header in the pack file (as mentioned above in the pack file section). When delta encoding was originally added, git started with the ref based delta, the OBJ_OFS_DELTA object type was later introduced in #eb32d236 mainly to reduce the size of the pack file. Whether the client supports offset based deltas in the pack file can be signaled during the pack file negotiation by setting the ofs-delta capability (if the server indicates that this is supported). ofs-delta Server can send, and client understand PACKv2 with delta referring to its base by position in pack rather than by an obj-id. That is, they can send/read OBJ_OFS_DELTA (aka type 6) in a packfile. As a simplification for our clone implementation we don’t use this capability in the request and therefore only need to implement the lookup of ref based base objects. a patch function to recreate objects based on a base object and the delta content. We can therefore fully recreate the objects given the pack file we received. To create a valid git repository we need to create a directory layout and a set of files that git requires to recognize this directory as a valid git repository. Conceptually the files and directories can be roughly split into the object store, refs and the index areas. The Git Repository Layout man page has detailed information about the contents of the git directory. To correctly populate the git object store we need to understand the object types git supports, how it represents those objects and how they are stored on disk. The commit stores the commit message, dates and authore/commited information and points to a single tree object. A commit can have zero (for the root commit(s)), one or more parent commit ids. The commit pointer to the parent(s) forms the commit graph. A blob stores the actual file content without any meta information (e.g. the file name). A tree contains path names and permissions with pointers to blob or tree objects - it represents the directories and filenames of the tracked content. A tag an annotated tag stores the tag message, date and the identiy of the person creating the tag. Git also uses so called light-weight tags that are simply pointers in the ref hierarchy without having any additionaly tag meta information. See http://git-scm.com/book/en/Git-Internals-Git-Objects for further detailed information. As already mentioned, git stores a single pack file and generates an accompanying index file without creating any loose objects during the initial clone. Instead of using the same approach (and because we already read the pack file) we simply unpack the objects and store them as loose objects. This is obviously a less efficient approach and makes our clone operation much slower than it needs to be. As our internal packfile representation already contains the decompressed objects, we simply need to store them correctly (recreating the deltified objects) without providing functionality to create each object type from scratch. Git concatenates the header and the original content and then calculates the SHA-1 checksum of that new content. where headerForBlob objType = objType `C.append` " " `C.append` C.pack (show $ C.length content) `C.append` "\0"
unpackPackfile InvalidPackfile = error "Attempting to unpack an invalid packfile"
tt _                = error "Unexpected blob type"
writeDelta _repo _ = error "Don't expect a resolved object here"
unpackPackfile uses a 2-pass approach. It firstly writes out all the undeltified objects directly and accumulates a list of unresolved deltified objects. It then applies the writeDelta function to each of the deltified objects which looks up the base object that we just stored and recreates the undeltified object by applying the patch function using the base and delta content. The readObject function is the opposite of the writeObject and knows how to read the objects from the local repo. This set of functions allows us to unpack all the objects (both deltified and undeltified) contained in the pack file into the local .git/objects object store. With the objects in place git now needs an entry point into the commit graph. 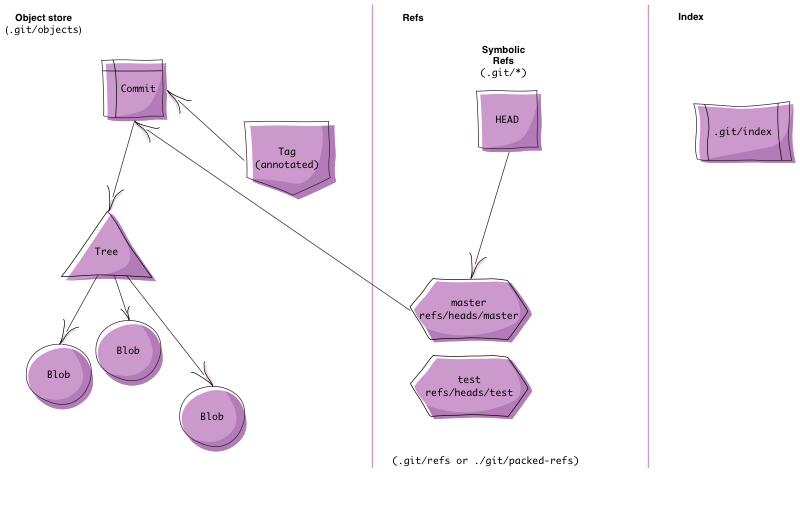 The branches and tags are those entry points and the tips of the branches and tags are known as refs, names that refer to the SHA1 based object ID for the object in the git repository. The refs are stored under the $GIT_DIR/refs directory (e.g. .git/refs/heads/master or in a packed format under .git/packed-refs). Refs contain the 40 hex digit SHA1 directly or a symbolic ref to another ref (e.g. ref: refs/heads/master). The special symbolic ref HEAD refers to the current branch. The refs in the refs/heads directory are the local branches of the repository. The refs/tags directory contains both tags. In the case of an annotated tag the tag points to the tag object. For a lightweight tag, the tag file contains the object id of the tagged commit itself. The refs/remotes directory contains one sub directory for each remote that is configured (in this case the default origin). In the example the upstream repository has two branches master and pu and the symref HEAD that identifies the default branch of the upstream repositiory. Note: To simplify our implementation we ignore this optimisation and again store each ref in a separate file. We unpack the pack file and create objects in the .git/objects directory (it’s worth repeating - this is not how the native git client works - the native client creates an index file and use the pack file instead), then we create the refs and lastly the special symbolic ref HEAD. The refs that need to be created are known from the inital ref advertisements and are simply mappings from the object ids (in this case commit ids) to the full ref name. We again filter out the peeled tag refs and partition the refs into tags and branches that are stored in their respectives directories. Note: Although origin is the default name for the remote repository a clone originates from, the native git clone command has the option --origin <name> to set the name of the remote to something other than origin when cloning. As our clone command currently doesn’t support any options we simply use the default origin remote name in our implementation. After creating the refs the symbolic ref HEAD is created and it points to the same ref that is used by the upstream repository as the default branch (via its HEAD symref). updateHead  = fail "Unexpected invalid packfile"
liftIO $ writeFile (getGitDirectory repo </> symName) $ "ref: " ++ ref ++ "\n"
At this point the local git repository is actually usable (e.g. 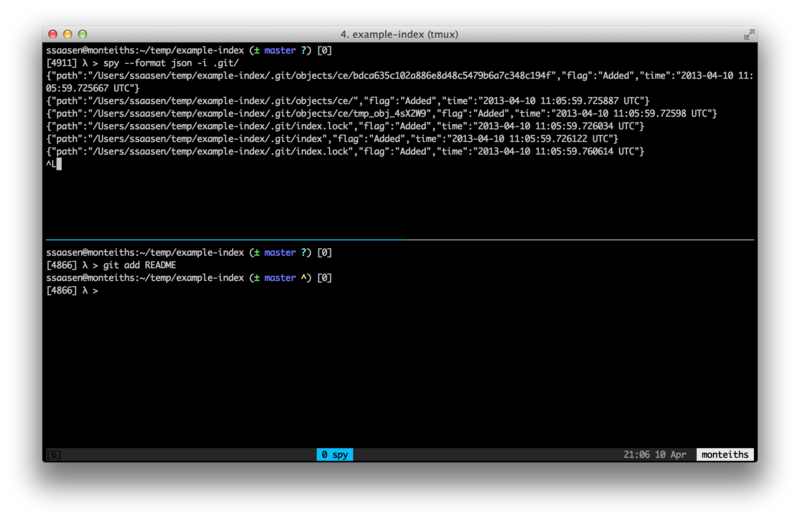 commands like git log or git checkout work), albeit with an empty working copy. With the object store populated and all the refs in place the next step is to “checkout” the files that match the repository snaphots HEAD points to. Read the HEAD symref and resolve the commit it ultimately points to to use as the tip of our checked out working copy. Given this commit we need to resolve the top level tree that our commit points to. Based on the tree we write out all the blobs that top level tree contains and recursively read the child tree entries to fully restore the directories and files in our working copy. This requires us to be able to retrieve the objects from the object store and to then parse each object type and create an appropriate in-memory representation to enable tree traversal and ultimately the correct creation of files and directories. objType' <- string "commit" <|> string "tree" <|> string "blob" <|> string "tag"
This is still a close representation of the object content just with some meta information about the type and the object id. In order to use the git objects, e.g. resolve parent commits from a commit object or read the tree entries from a tree object, we need a 2nd level of object parsing that turns the generic (but tagged) Object into a more specifc object representation. The object of type blob simply contains the content that is tracked by git. This is the actual file content so no parsing or reading is necessary. The blob content will be written as it is to the corresponding file in the working copy. […] the tree object, which solves the problem of storing the filename and also allows you to store a group of files together. Git stores content in a manner similar to a UNIX filesystem, but a bit simplified. All the content is stored as tree and blob objects, with trees corresponding to UNIX directory entries and blobs corresponding more or less to inodes or file contents. A single tree object contains one or more tree entries, each of which contains a SHA-1 pointer to a blob or subtree with its associated mode, type, and filename. 100644 or 644: A normal (not-executable) file. 160000: A gitlink, SHA-1 of the object refers to a commit in another repository. They are used to implement submodules. 040000: A subdirectory. Points to another tree object. Note: This is a very simplified version of resolving a ref. refs.c#resolve_ref_unsafe handles loose and packed refs and even the older symlink style refs. For our simple use case this is not necessary as the symbolic ref will have been written by our own code in a previous step. Resolving the tree involves reading and parsing the commit and then extracting the tree object-id from the commit. Note: While we do handle files modes (644 and 755) we currently ignore the other git modes (symlink and gitlinks (for submodule support)). After traversing the trees we now have a full checkout of all the files that correspond to the repository snapshot identified by the commit pointed to by the HEAD symref. Running a git status command in that git repository shows all our newy create files both as untracked and slated for deletion as we haven’t create the git index file yet. As our last step we need to create the index file that matches the file status on disk so that git status won’t report any outstanding changes. The index is also called the “staging area” or the directory cache (this should not be confused with the index that accompanies a pack file). In git the index is used to keep track of changes in the working copy and to assemble the changes that will be part of the next commit. The “index” holds a snapshot of the content of the working tree, and it is this snapshot that is taken as the contents of the next commit. Thus after making any changes to the working directory, and before running the commit command, you must use the add command to add any new or modified files to the index. Using a simple example we can observe how the index tracks file changes and status. The actual index file thus only contains a single entry, the entry for the LICENSE file. Based on the absence of an index entry for the README file commands like git status or git ls-files -o can deduce that the file is untracked. The index file entry contains meta data (e.g. modified time, permissions), the file path and the SHA1 of the blob object. In order to build up or stage the next commit, git creates blob objects when changes (whole file or partial changes via for example git add -p) are added to the index via git add. This means that commiting the change results in the creation of the required tree objects for the index entries that bind the files to their blob objects and the commit object that has a reference to that newly created tree. Now the index contains two entries and the README is going to be part of the next commit. The format of the directory cache index file itself is described in Documentation/technical/index-format.txt. This is followed by a number of sorted index entries where each index entry contains stat(2) data (ctime, mtime, device, inode, uid, gid, filesize), the SHA1 object id, a git type (regular file, symlink, gitlink), unix permissions, a couple of status flags and the path and path length of the file the index entry is about (“padded with 1-8 nul bytes as necessary to pad the entry to a multiple of eight bytes while keeping the name NUL-terminated”). The path name includes the directories from the top level directory of the repository. where magic = fromOctets $ map (fromIntegral . ord) "DIRC"
-- see `read-cache.c`, `cache.h` and `built-in/update-index.c`. -- FIXME: length if the length is less than 0xFFF; otherwise 0xFFF is stored in this field. remote: Compressing objects: 100% (103/103), done. Git is built on a small number of simple but powerful ideas.